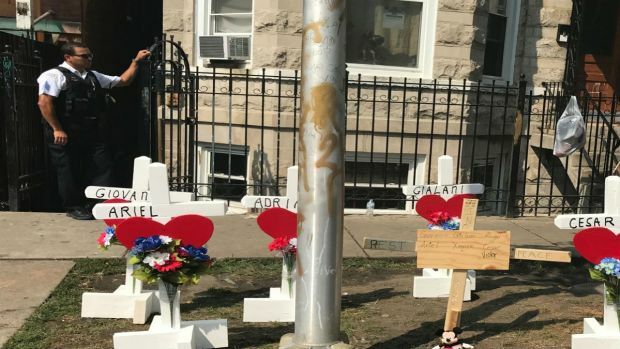 Eight people, including six children, are dead after a fire on early Sunday morning erupted in a three-story residential building near the Little Village neighborhood on Chicago's West Side – one of the city's biggest fires for years , officials say. Fire Department Commissioner Jose A. Santiago said the call came from a woman leaving home from work came and smelled the fire. Police say the victims were immediately found on the second floor (the first floor was vacant) of the structure, which was described as a "coach house". When firefighters entered the building, seven people were already dead, officials say. Two more people, a teenager and an adult , were seriously injured and transported to Stroger Hospital, Santiago said. "We have not seen that in many, many years, this number of casualties and injuries in one place," said Santiago. "That's very unusual." A firefighter lieutenant, Santiago said, was also injured in the fire and transported to Rush Hospital, where he remains in good, stable condition. The cause of the fire was not immediately known. Officials also say that it was unknown if there were smoke detectors in the residence. Mayor Rahm Emanuel and the local city council were both alerted, Santiago said. This is an evolving story. Check for updates.